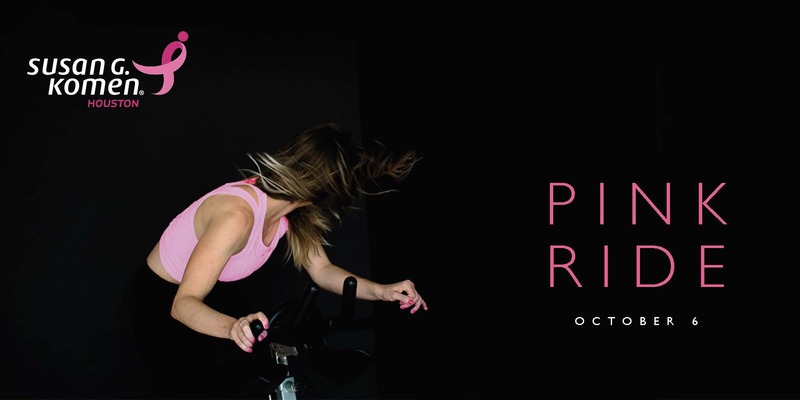 HOUSTON (September 27, 2019) – On Saturday, October 6, 2018 at 6:00 p.m., DEFINE: The Heights will host DEFINE Houston’s Pink Ride, benefiting Susan G. Komen® Houston, at their Heights Mercantile location. The Pink Ride is an event designed to encourage personal wellness while raising awareness of Komen Houston’s mission to save lives and end breast cancer. Registration is open on MINDBODY/the DEFINE app, with only 50 spots available. Houstonians will be able to rest up after the Komen Houston Race for the Cure® that morning and then join us again for a good ol’ fashioned dance party on a bike at night. Susan G. Komen® Houston is the local leader in breast health services, focused on bettering the lives of those facing breast cancer and meeting the most critical needs of the local communities it serves and funding cutting-edge breast cancer research. Throughout Brazoria, Chambers, Fort Bend, Galveston, Harris, Liberty and Montgomery counties, Komen Houston connects patients to breast health resources, eliminates disparities by providing financial assistance to those in breast cancer treatment and collaborates within our communities. Established in 1990 by passionate volunteers, Komen Houston has granted over $50 million to local programs for breast cancer education, life-saving screening and treatment programs and innovative, cutting-edge research. If you would like to learn about volunteer opportunities or get information about the Komen Houston Race for the Cure® and other events, visit www.komen-houston.org or call 713-783-9188. DEFINE is more than a fitness studio. In addition to offering barre, cycling and yoga classes under one roof, DEFINE’s mission is to educate people on how to become their absolute best. DEFINE believes that physical strength, length and balance impact both states of mind and being and each studio creates an atmosphere that inspires results, fosters community and gives back to others in order to achieve sustainable health and happiness.